This is a cute little card I made using Fanfare papers, Cranberry, Sky, Pacifica & White Daisy cardstock. 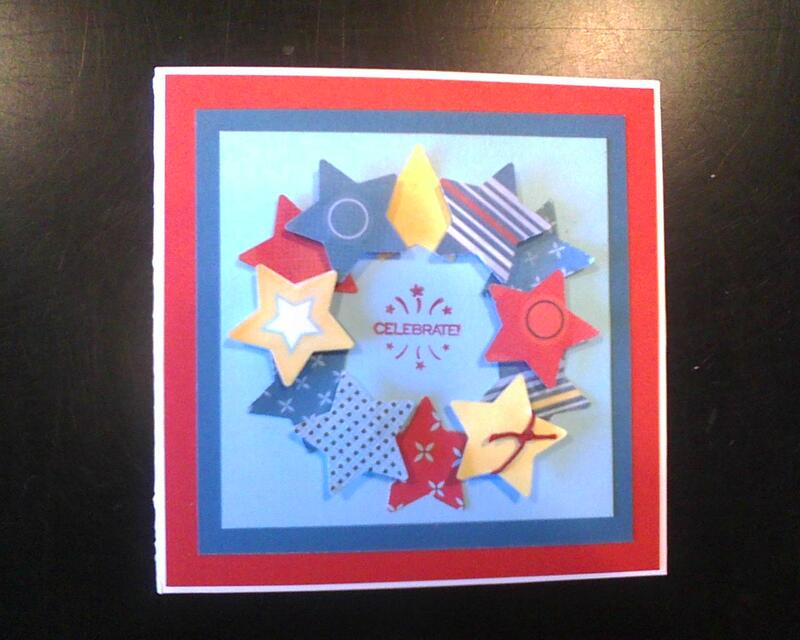 June SOTM Jubilation & Cranberry waxy flax, and foam dimensional tape. With the much anticipated New Autumn/Winter 2011 Idea Book coming out August 1st. We have been given a little insight to which of the current 8 paper packs will be staying and which will be going. Retiring Paper Packs - Wings, Miracle, Sweetheart & Bliss will be gone at the end of July. Along with the 4 older paper packs that carried over from Autumn/Winter 2010 catalog - Magnifique, Hooligans, Olivia & Mistletoe. CTMH July's Campaign - Bang for Your Buck! Close To My Heart has announced their July Campaign Promotion. It's called "Bang For Your Buck". During the month of July, make a minimum purchase of $50.00 from the Spring/Summer 2011 Idea Book and add a bonus item for just $1.00. (limit one bonus item per qualifying order). You can browse the catalog here, and place your order here. This is the perfect time to stock up on items from the current idea book before the new book premiers on August 1st. This year there has been alot of rain in Montana! The average precipitation as of today should only be 8.42" and we are at 14.43", that's 6" over the average. We went camping over the weekend to a place we went last year after we bought our travel trailer. It is located just outside of Big Timber, MT right on the Boulder River. A beautiful campground with stocked fishing ponds for the kids. And had the river not been so high, it would've been the perfect spot for my hubby to do some fly fishing again. Below are two videos taken looking from approx. the same spot at the Boulder River. The first one was taken with my older smaller camera, not the best video with the sun glare but you can see how much lower the water was last Sept.
And this video was just shot Saturday - WOW, big difference!! We did get out and do some hiking just in the Gallatin National Forest to the Natural Bridge & Falls. It was a beautiful day and the Falls were amazing! One of the informational boards we saw stated that you see the falls during high water, otherwise the entire Main Boulder River travels underground We look forward to going back when the water is back down. I have some really great pictures to scrap once I get them printed too! There has been a lot of flooding around the state, I feel very fortunate that we live in an area that has not been affected by the rising waters. My heart aches for those that have been in the state of Montana and other states also! Last night on the news we saw the flooding in Minot, ND, homes in water up to the roof. It is just devastating! If you saw last month's special - You and Me scrapbooking kit and thought of ordering it but didn't, you still have a few days left in this month to get yours. 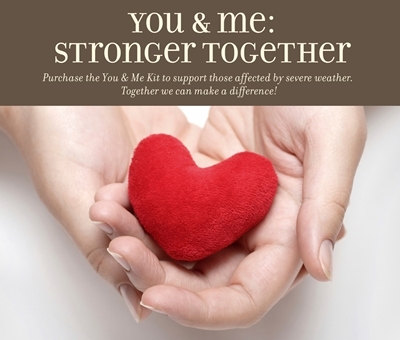 Close to my Heart brought back the kit with a new promotion "You & Me: Stronger Together". The kit only costs $15 and a portion of the proceeds will be donated to the American Red Cross 2011 Floods and Tornadoes relief operations. Check out this video for the Trees & Things Stamp set that CTMH Corp created. It is a great technique for your trees. I had the ladies at my monthly class use it on their trees the past 2 nights and it looks so great! I will be adding the 2nd generation to my tree on my "You are my Sunshine" Mayberry layout. It gives it that nice dimensional feel of the leaves blowing in the wind I think. I hope everyone had a wonderful Father's Day & enjoyed time with their dads! I would've probably spent time with my dad if he didn't live 1,250 miles away! But I did get to visit with him on the phone for a while. I made this workbench gift card holder for my hubby for Father's Day. A friend of mine bought the pattern online and shared it with me. I thought it turned out so cute! Hubby has lots of tools, but is really into fly fishing so we got him a gift card to Cabela's so he can go get some fly fishin' gear. 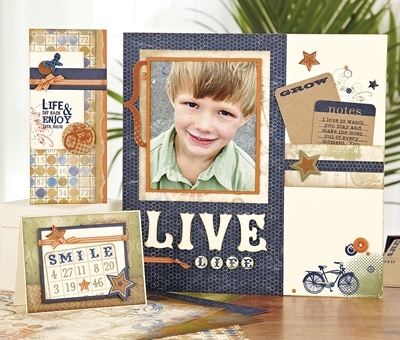 Supplies used - CTMH cardstock, brads, SU tool stamp set, CTMH Universal Backgrounds stamp set, CTMH silver embossing powders. It's Friday already!! Wow, where did the week go?? Hmm, lets see Monday thru Thursday was busy running my oldest son to Football camp in the morning & then taking both boys to Soccer camp in the afternoon, that's where the week went! Today after taking our dog Molly to the vet for her shots and to be groomed we are back at home for an uneventful day, yea! The boys are outside playing and riding bikes and I'm in here cutting up papers for next week's scrap class. I have to admit I completely scraplifted these pages from a fellow CTMH Consultant, LaJeania Hicks. So she gets all the credit for the creativity. I believe she must have designed them too, because I couldn't find the sketch in any of our idea books. But the pages were just so stinkin' cute, I had to lift them! ;o) I'm not sure what pics I will be adding to my pages just yet, but I can pretty much bet they will be of my guys! Hemp on tire swing & letters. Until next post, hope everyone has a great weekend & Father's Day! I've heard well I should say read different blogs that have this "Mojo Monday Challenge" posts on there or seen pics on the CTMH Message Board & never really checked it out. Well today I saw someone's post and thought, I'm going to see what it is all about and I'm glad I did! It was fun to do! 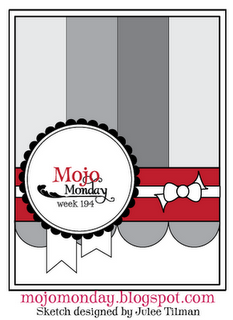 Here is my entry for their Mojo Monday #194. Hope you like it! I made it using Close to my Heart Wings papers and cardstock, Rosy Regards & Dreams Come True stamp sets & Black Mini Medleys. Oh and my Martha Stewart decorative scallop punch. This is the sketch to create from on the Mojo Monday blog. Love the talents of this lady! Just wanted to share in case you haven't been over to Jeanette's blog lately for her Weeks of Wonder technique posts. I will be trying this one out this weekend! I have stamped with paints in the past, but will be trying out this one with CTMH's Create a Shade Paint & Re-Inkers. Just love that with our Re-Inkers, we have the ability to create any of the 60 colors in CTMH's color palette. We have all seen the devastation from the tornadoes that have hit the Midwest & Southern states. They are actually showing the latest on NBC Nightly News right now as I write this. Close to my Heart is such a wonderful company! A few months ago they created a special "Hope for Japan" stamp set and the proceeds went to the American Red Cross to assist in the relief efforts in Japan. Now they have brought back last month's special - You & Me Scrapbooking Kit to help with the Floods and Tornadoes! I am so proud to be a Consultant for this caring company!